Visit Artic Glacier ice for more information on our ice. Our milk comes from Crystal Creamery in modesto. FOR INFORMATION ON DRY ICE CLICK HERE! The Meadowlark Dairy was founded in the early 1900s by Walter Briggs Sr. on 153 acres on Foothill Road. Meadowlark was the first certified dairy in California, earning a Grade A designation for cleanliness and quality. Jannes and Janna Takens immigrated to the U.S. from Holland after World War II and first moved to Berkeley where Janna's cousin who sponsored them lived. Eventually the Takens settled in Pleasanton, where they still live, and began working on the dairy. In 1958, the Takens' signed a 10-year lease for the dairy and bought it in the 1960s after Briggs' death. The Briggs family sold the property, so Takens moved the cows from Pleasanton to Tracy in 1968 and built a milk processing plant at 57 W. Neal St., where the dairy remains today. 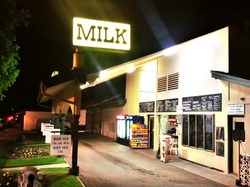 The dairy has been a drive-though since it opened in July 1969, replacing the former drive-through dairy on Foothill Road. Today the Dairy is run by Jannes and Janna's son Bruce and his family. Come on by and let one of our eager hardworking young adults help you out!